If you’ve been eagerly following the progress of the Yamaha MT-01 then you’ll be pleased to know that it'll be here in a matter of weeks. Yamaha UK has just said that the 1600cc ‘torque-sports’ bike will be available from dealers by the end of February or the beginning of March at the latest. 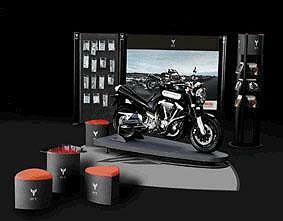 The V-twin will set you back £9349 on the road and can be had in black or silver. Demo bikes should be available from official Yamaha dealers and Yamaha hasn’t missed the opportunity to cash in on the MT-01 cool, with a full range of bolt-on parts and plenty of ‘lifestyle’ goods to choose from. Download the world first test of the MT-01 from our Bike Reviews section here.